Antibodies produced by clone MF3 have been shown to inhibit IL4 induced thioglycollate-elicited peritoneal macrophage fusion and significantly block IL4/GM-CSF-induced bone-marrorw derived macrophage fusion. IL4 treated murine thioglycollate-elicited peritoneal macrophages. Our Abpromise guarantee covers the use of ab80080 in the following tested applications. WB Use at an assay dependent concentration. Predicted molecular weight: 53 kDa. 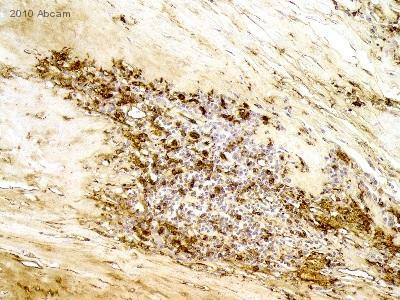 Immunohistochemistry (Formalin/PFA-fixed paraffin-embedded sections) - Anti-CD36 antibody [MF3] - Low endotoxin, Azide free (ab80080)Image courtesy of Dr Jaykumar Thumar by Abreview. ab80080 staining CD36 in human coronary atherosclerosis plaques by Immunohistochemistry (Formalin/PFA-fixed paraffin-embedded sections). Tissue was fixed with paraformaldehyde and a heat mediated antigen retrieval step was performed using citrate buffer pH 6.0. Samples were then blocked with 0.1% BSA for 30 minutes at 36°C followed by incubation with the primary antibody at a 1/150 dilution for 24 hours at 4°C. A biotin conjugated rabbit polyclonal was used as secondary antibody at a 1/200 dilution. ab80080 staining CD36 - Low Endotoxin (green) in Mouse RAW 264.7 cells by ICC (Immunocytochemistry). Cells were fixed with paraformaldehyde, permeabilized in 0.1% Triton X-100 in 2% BSA for 15 minutes and blocked with 2% BSA for 1 hour at 22°C. Samples were incubated with primary antibody (1/200 in PBS + 2% BSA) for 18 hours at 4°C. 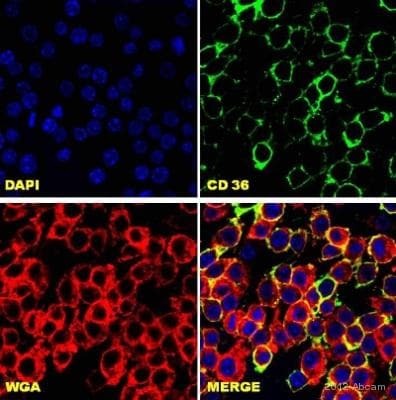 An Alexa Fluor®488-conjugated Goat anti-rat IgG polyclonal (1/750) was used as the secondary antibody. Thanks for your information about mouse CD36 antibody. I want to detect CD36 from c2c12 cell lines, a mouse cell lines. I just request you if you send me a little aliquot 10 microlitre,I will just check 1 exp, then I will order. I will need a good amount to order. Please let me know it is possible or not. Have you CD36 mouse antibody to detect endogenous expression. Please let me know. We have a number of antibodies to CD36 that are guaranteed to detect endogenous expression. For example, we have the mouse monoclonal ab17044 which reacts with human and rat for use in blocking, ICC/IF, WB, IHC-P, IHC-Fr, and Flow Cytometry. We also have the rat monoclonal ab80080 which reacts with mouse and human for use in IHC-P, WB, IP, functional studies, Flow Cytometry, and ICC/IF. If you could please let me know what species and application you are working in, I would be happy to make more specific recommendations. Please recommend an antibody that will inhibit function of murine CD36. Thank you for contacting us. The following article describes development of the ab80080 clone, MF3, and how it was used in a neutralization assay. As I mentioned in our conversation, you will want to decide if the neutralization assay has any relevance to what you want to do. Helming L et al. The scavenger receptor CD36 plays a role in cytokine-induced macrophage fusion. J Cell Sci 122:453-9 (2009). PubMed: 19155290 Here is a URL link to the article: http://jcs.biologists.org/content/122/4/453.full I hope this information is helpful to you. Please do not hesitate to contact us if you need any more advice or information.